You are here: Home / Hoppy Thoughts Blog / Escaping the Concrete Jungle: Great Beer and Good Vibes at Smog City Brewing Co. The highways around Los Angeles were chaos. Packed with sluggish traffic with congested lanes for miles. Clogged arteries of humanity. I breathed a sigh of relief, stepping onto the curb, finally off the road and away from the throngs of people. 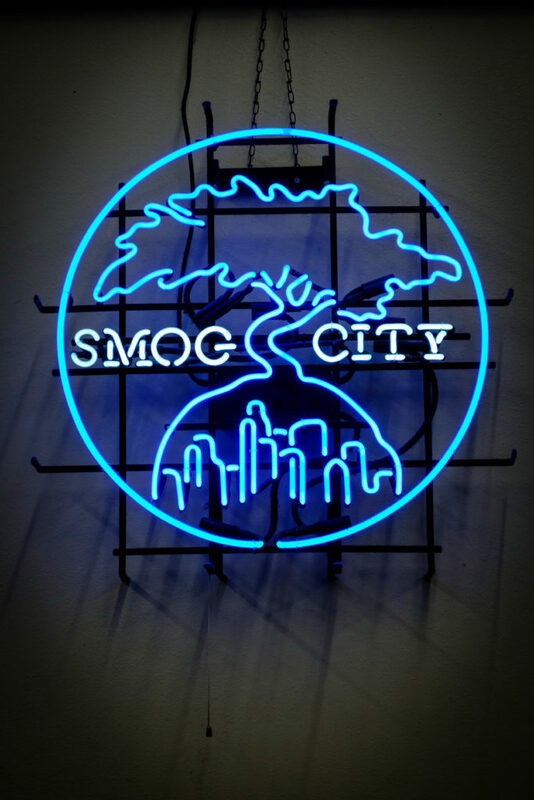 In the LA suburb of Torrance, Smog City Brewing Company was just opening its doors for the evening. As an out-of-towner all the traffic had me on edge, I was eager to pull up a stool, sip on a beer and relax. Entering the taproom I stood up at a high table of chrome and brushed steel. Behind me rows of barrels lined the wall while the Smog City logo burned bright from a neon sign across the room. Josh greeted me from behind the bar. He pointed me towards the brewery’s lineup of current beers on tap and began helpfully walking me through the list. When making my beer selection I was torn. 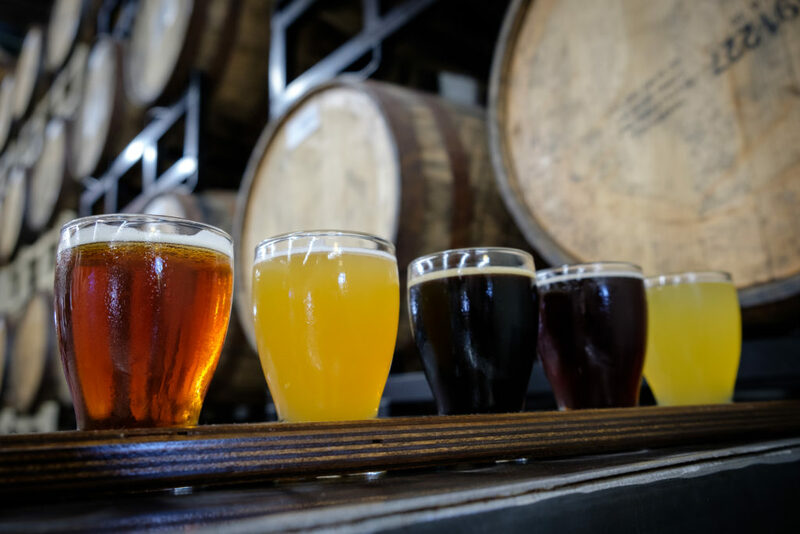 A robust sour program as well as a host of award winning beers spanning multiple styles had we switching up my choices with each new beer I read on the menu. I knew I could not be limited to the five tasters that come in a flight. Sabre-Toothed Squirrel, an American amber ale is a Smog City fan favorite and award winner. Taking medals at both the Great American Beer Festival and World Beer Cup, expectations were high as I took my first sip. Medium bodied and well balanced, Sabre-Toothed Squirrel combined a caramel malty backbone with a strong hop profile to create flavors and notes of citrus, pine, honey, and biscuit. The finish was crisp and toasty. Sipping my beer I stared up at a framed Smog City emblem on the wall. 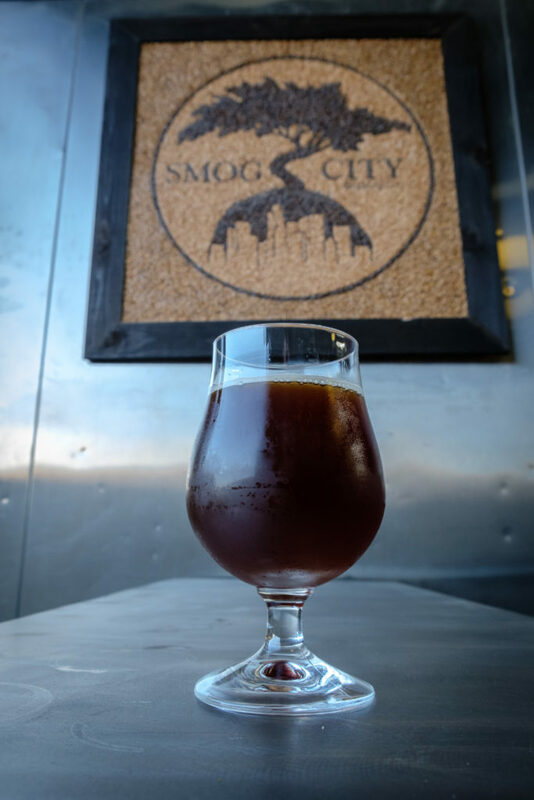 It showed a curvy tree with a wide canopy flanked on both sides by the brewery’s name, Smog City. The tree and the brewery name both sprouted from the skyline of Los Angeles. Brendan, Smog City’s taproom manager caught me admiring the piece. That sentiment carried over into Smog City’s community activism as it truly strives to give back and celebrate the place where it has set its roots. Of the many charities that the brewery contributes to it’s their partnership with the non-profit Food Forward that sticks out most. Rounding up otherwise unused and wasted kumquats, Smog City and Food Forward work together to collect this high yield/low use fruit and brew it up into a tasty beer. Through this partnership Smog City’s Kumquat Saison was born. Chatting with Brendan, I continued sipping on my flight of tasters. Spittin’ and Cussin’, a brown sour ale and one of my favorites in the style to date is a testament to the success of Smog City’s burgeoning barrel aging program. Aged in wine barrels and brewed with a generous helping of fresh cherries it is deep amber in color but with a light mouth-feel. Sweet and tart at the same time its balance was perfect and I could see it swaying the hesitant sour drinker to a full fledged convert within a few sips. I knew I’d be upgrading my taster into a full pour before the night was over. It wasn’t long before John Porter, Smog City Brewing’s founder and brewmaster pulled up a stool next to me, a beer of his own in hand. A celebrated brewer and recognized statewide, John filled me in on his vision for Smog City. Teaming up with his wife, Laurie he worked to perfect the brewery’s recipes while Laurie, a sales extraordinaire worked to get the brewery name out there. As I reached for yet another taster it was beginning to become clear why John’s beer had remained in such high demand since his home brewing hobby days. The flagship Coffee Porter is another of Smog City’s acclaimed crowdpleasers. Part coffee, part beer the full bodied flavor is packed with chocolate coated espresso beans, roasted malts and dark chocolate. Smog City teamed up with local coffee roasters to pack each barrel of beer with over five pounds of fresh coffee. Crisp and easy drinking it satisfies both my love for good coffee and good beer all in one glass. Looking around the taproom I could see there was a lot that set Smog City apart. Things that put it a cut above the rest. The awesome beer, the community partners, the social space brought it all together. What’s more it was the Smog City team, from Josh at the bar, to connecting with Brendan and chatting with John that the real passionate essence of the brewery came out. I came in off the street frazzled by the big city chaos. I cursed the traffic and the bustle of people but in Smog City I found a connection, an oasis of positivity and good vibes. He took a long sip from his glass.